﻿ The magazine "International Relations"
The magazine "International relations: politics, economics, law" is an interdisciplinary scientific and theoretical publication of the University of World Economy and Diplomacy of the Ministry of Foreign Affairs of the Republic of Uzbekistan. Scientific-theoretical magazine "International relations: politics, economics, law" is registered in the Press and Information Agency of Uzbekistan on January 11, 2007 (the license № 0127). The journal is registered in the National Book Chamber of the Republic of Uzbekistan, has an index of the printed version ISSN 2010-6203, which provides information about it in the appropriate international refereed journals. The journal publishes articles in Uzbek, Russian and English. The magazine is published in printed form at intervals of four issues per year, i.e. on a quarterly basis. 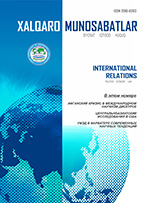 Editorial Board accepts articles related to the analytics of international relations and world politics in the modern world of international legal regulation of various spheres of society and the state, the development of the world economy and international economic relations, the current problems in the social and humanitarian spheres of modern Uzbekistan and the international community for review. The editors reserve the right to publish articles and other areas of science. The magazine can take to the publication of theoretical, methodological, thematic reviews of analytical articles, scientific research; scientific review of publications, etc. The fee for the publication of articles in the journal is not charged.